Team Reward Systems Sara Allred Center for the Study of Work Teams, University of North Texas. As organizations are moving into team-based management systems, the implementation of team reward systems is on the rise. A team reward system is a system in which a group members pay is at least partly contingent on the performance of their group or team. Team rewards should create increased cohesiveness and cooperation as well as reinforce individual performance when they are used. Organizations using team reward systems begin to look at team reward systems as ways to motivate employees to make larger, more significant contributions to the organization. There are many possible reasons to support the implementation of team reward systems. The most fundamental reason is that the organization structure is team-based management. Also, team reward systems promote team productivity and increase cooperation among team members. Some organizations use team reward systems because they give employees an opportunity to see more directly the rewards for their hard work. Others continue to use more long term reward systems in addition to team rewards, such as gainsharing or profit-sharing. There are certain guidelines to consider when using team reward systems. First, the team leader and/or management should be able to communicate well with other group members in order to explain the process of team reward systems and be as fair and consistent as possible as group members adjust to the change. It is also important for team leaders to consider the size of the reward, frequency of payout, and allocation procedures that the organization will be using. Individual rewards should also be examined closely to determine to what degree they should be kept and how new performance standards and appraisals should be conducted. A specific set of measures should be used to evaluate the effectiveness of individual rewards as well as team rewards. Also, team leaders should examine the value of intrinsic motivation and how it will increase in team members as team reward systems are used. Team Reward Systems are on the rise. As organizations are moving into team-based management systems from classical theories of management where top-down communication is the standard, team reward systems are also being implemented. When team reward systems should be implemented as an organization moves from classical management to team-based systems is a source of constant controversy. Some believe that reward systems should be changed immediately and at the very beginning of the transition. Others suggest that new team rewards systems should be implemented after the employees have adjusted to the new team environment. These controversies will be addressed. The fact remains that the type of reward system used by an organization is very important because it has a tremendous ability to influence the behavior of the employees. Team reward systems are the newest and fastest growing reward strategies (DeMatteo, Eby, & Sundstrom, 1998) because of the huge increase in organizations moving to team-based environments. A team reward system is a system in which group members pay is at least partly contingent on the performance of their group or team. However, a challenge exists when trying to decide how to pay and reward individuals in a team-based environment. In deciding to use team reward systems, it is assumed that team rewards will have a qualitatively different effect on employee motivation than individual rewards have. Ideally, team rewards will increase cohesiveness and cooperation as well as reinforce individual performance. One of the main goals in using team reward systems is to increase levels of cooperation among employees and decrease levels of competition. However, if not used correctly, team reward systems can also foster competitiveness. As organizations move into team-based systems for management and eventually into team reward systems, performance becomes the "product of how well we leverage skills into products or services" (Thornburg, 1992). This means that team rewards and incentives will take on a much larger role because productivity is no longer based on individual efforts, but on the efforts of an entire group to produce the best product possible. Organizations begin to look at team performance reward systems as ways to motivate employees to make larger and more significant contributions to the organization. There are many possible reasons for implementing a team reward system, the most fundamental and basic reason being that the organization structure is team-based management. As organizations explore the option and use of team-based management, it will become increasingly harder to separate and distinguish the contributions of individuals. There becomes a greater interdependency between jobs and tasks because of the way work is now organized (Nickel & ONeal, 1990). In addition, it may be easier to begin evaluating performance by evaluating the team as opposed to the individual. Thus, if the team is being assessed in the performance appraisal, it would seem likely that rewarding the team for their performance would be a complement of the team appraisal. The issue of performance appraisal is very large and encompasses many topics that cannot be addressed at this point. However, it may be said that if an organization has begun using team-based management and does not include the team in performance appraisals, the employee may become very frustrated (Parker, 1994). If an employee is expected to find his or her motivation within the realm of a team and achieve a goal that the team has set, the employees performance should be appraised within a team setting as well. It can also be said that it may be possible and totally appropriate to eliminate performance appraisals all together in a team-based organization. The complications of how to reward the group as opposed to individuals for performance appraisal may be too complex to be able to solve correctly. Also, it is extremely difficult to keep competition at a minimum within the group or between groups if performance appraisals are done at the group level. Competition may be fostered because of these performance appraisals. It can be said that if the team has done good work and met their goals, then everyone on the team should receive the exact same reward. Another reason for using team reward systems is to promote team productivity and enhance cooperation among team members. Setting group goals and achieving those goals as a team can serve as a wonderful motivator as well as a tremendous way to foster cooperation and cohesiveness within a team. An example that has been repeatedly used to understand the effect of achieving a goal as a group is that of a group of farmers who work together to harvest a crop. As the time for harvest approaches, the farmers harvest the crop together and now have a wonderful crop to share amongst themselves. Thus, the reward they have received is the crop, which is the culmination of their goal (Hitchcock & Willard, 1995). The group of farmers is now highly cohesive and motivated to begin planting the next years crop because they have been involved in a cooperative effort that has been very intrinsically motivating. Another possible reason for using team reward systems is in order to avoid the limitations of large group-level reward plans, such as gainsharing (DeMatteo, Eby, & Sundstrom, 1998). It is possible that team members may believe they can make more direct contributions if they are in smaller group where rewards can been seen and used more easily than larger reward plans. This may be because smaller group reward plans offer a direct route between performance and rewards, which will increase the group members perceptions of their individual responsibility. However, this theory is disputed by Hitchcock and Willard (1995) who believe that rewards should not be used at the team level and that gainsharing is a good way to reward employees. Hitchcock and Willard believe in rewarding people at the Primary Functional Unit level (PFU), which is the level at which the group is relatively autonomous from other groups, and they believe gainsharing is the best way to reward people at this level. Organizations should determine for themselves if gainsharing would be a good way to reward their team members depending on their own specific circumstances and the size of their team and whether or not a "direct line of sight" to the reward is needed for the teams in their organization. Furthermore, there are several limitations to using team reward systems. One major limitation is that an employee may have difficulty seeing how his or her effort is measured with the groups performance. This reason may be especially significant in high-achievers. When they are rewarded with the same reward and at the same level is lower-performing counterparts, they may become very frustrated and feel like they are being treated unfairly. This may cause these high-achievers to lose motivation to perform at the group level. A second limitation is that team reward systems have the potential to cause competition rather than cooperation. A team may be unwilling to share information and communicate with another team because they perceive competition between teams. This can be especially problematic when the teams of the organization are required to work closely together. Also, a possible limitation or resistance of an organization to using team reward systems may be because there are not clear, specific guidelines available for each organization to use that will ensure the effectiveness of team reward systems. There are many conditions under which team reward systems may succeed or fail, and the exact conditions under which team reward systems will be effective are unclear. There is a definite need for more research concerning the effectiveness of various implementation strategies or team reward systems. The majority of research at this time is focused on the basic characteristics of team reward systems as opposed to individual rewards. There are certain characteristics, guidelines, and variables to consider when the decision is being made to use team reward systems. First of all, the team leaders or persons who are initializing the implementation of the team reward system should be able to communicate the plan well to the team members who will be effected. Also, the team leaders, or management, should be fair and consistent as the team members adjust to the new team reward system. Also, the rewards that the team members receive should be timely so that the group can begin to recognize the connection between the reward and the work they are doing, and there should be plenty of rewards available for distribution (Thornburg, 1992). An important element to consider when implementing team reward systems is the size of the reward. Reward size has been shown to correlate with pay satisfaction and motivation (Wagner, Pubin, & Callahan, 1988). If the reward size is rather large, then it is in the groups best interest to work together with as much cooperation as possible in order to achieve this reward. However, there is not an exact number that has shown to be the most effective reward size. Another variable is the frequency of the payout of the reward. Again, there is limited research on what the optimal frequency is to gain maximum effectiveness, but the frequency should be enough to continually reinforce the desired team behaviors. Lawler (1981) believes that the amount of rewards that the organization is able to allocate to the employees is a critical factor in determining the motivation of the employee. Therefore, in the initial determination of size and frequency of the allocation of rewards, leadership should carefully research and consider the effect that the size and frequency of the reward will have on the employees motivation. Motivation will be discussed further as it is a critical success factor in team reward systems. Schuster & Zingheim (1992) provide different options to consider as an organization determines how frequently to give rewards. Rewards can be given at the same time that performance is measured. Or, rewards can be given by the use of a reserve fund. This allows the company to reward frequently but hold back a part of the reward in order to account for annual performance results. Schuster & Zingheim (1992, p. 218) say, "if the reserve fund is positive at the end of the year, the employees receive their share of the balance. If the reserve fund is negative at the end of the year, generally the organization takes the loss". A third option in deciding the frequency of payout is paying out rewards over time after the end of a particular performance period. In this case, part of the reward may be paid at the end of the fiscal year or at the end of this performance period, and the remainder of the reward would be paid out over a designated period of time. This approach can be used as a means to retain employees. Schuster & Zingheim (1992) believe that the place to start in determining the frequency of payout is matching performance periods to rewards, and when deciding on a type of method to use, consider what will motivate the employees, reflect performance over time, and the organizations capabilities. There are two different types of reward allocation procedures that can be used. These are equity norms and equality norms. Equity norms mean disbursing the teams reward in proportion to the contributions of the individual team members. Equality norms mean dividing the teams reward equally despite the varying degrees of contribution among the team (DeMatteo, Eby, & Sundstrom, 1998). The choice of which style to use is basically dependent on the circumstances of the organization and should be chosen carefully by each organization. However, Hitchcock and Willard (1995) believe that the wealth should be shared equitably among team members so as not to turn rewards into a contest. It is possible for a dilemma to arise when trying to decide which type of system to use. If all team members receive an equal reward, cohesion and support amongst team members may result. However, team performance may be increased if equity norms are used. The dilemma arises when management must choose between cohesion in the team or maximizing team performance. According to DeMatteo, Eby, and Sundstrom (1998), both can be used. They propose a solution in which an individual may be eligible to receive merit pay increases each year because of individual effort, a team will receive team-based rewards that are allocated equally, and a gainsharing program is used based on the entire organizations productivity. In larger organizations, this approach may be very feasible and very helpful. However, it may not be possible to use this exact solution in a smaller organization, but it may be in the organizations best interests to find a creative solution in which all three of these types or rewards may be used. Furthermore, individual differences may also effect the success of the team reward system. The members perception of his or her ability and contribution to the groups overall performance is critical in understanding the different reactions the team members might have to the implementation of team reward systems. It is likely that the person in the team with the most ability will initially react negatively to the implementation of team reward systems. In addition, each persons need for achievement will have an effect on their acceptance of team reward systems. People with a high need for achievement will seek out situations where he or she can have a sense of accomplishment because of their individual effort. Therefore, a team reward system may not appeal to this person initially, and he or she may have a difficult time adjusting to the change. It is extremely important that the management and leadership responsible for the implementation of team reward systems be sensitive and able to recognize these situations at this critical time. According to DeMatteo, Eby, and Sundstrom (1998, pp. 166-167), these individual characteristics will have a tremendous impact on the effectiveness of teams as well as one other characteristic, which is referred to as "individualism-collectivism". An individualist will prefer to work alone and place a high value on individual goals and autonomy. A collectivist places a high value on group goals, cooperation within a team, and concern for the group. People who are definite individualists may never be able to fit properly and most effectively into a team reward system. Therefore, these characteristics should be carefully looked at when making the decision to move to team reward systems. However, there is a limited amount of information regarding the exact ways that individual differences impact the effectiveness of the team reward system. It is also important for management to understand the nature of the teams in his or her organization in order to understand how the characteristics of the nature of these types of teams impact the effectiveness of team reward systems. For instance, task interdependence is the degree of interaction on different types of tasks among the group members. Generally, if a team is high in task interdependence, the contributions of individuals become increasingly unclear to determine (DeMatteo, Eby, & Sundstrom, 1998). Therefore, if the management determines that the teams in his or her organization are very task interdependent, then team reward systems will more than likely be successful. Another characteristic of teams to consider is between-team interdependence (DeMatteo, Eby, & Sundstrom, 1998). If the teams in an organization are high in between-team interdependence, team reward systems might have trouble being successful. This is because different teams in the organization work together a great deal. It might be very difficult for the management or team leaders in this type of organization to devise an effective plan for using team reward systems when the actual teams are so closely intertwined. It might be difficult to determine when, where, and how to reward the teams when they work so closely together. Other factors to consider when implementing team reward systems are the size of the team and the stage of development into team-based management that the organization is at currently. The size of the team will have an impact on the ability of the team as a whole to motivate other team members. The stage of development refers to different cycles the team may encounter as time progresses. The team may be a bit low in motivation at some point or it may be experiencing a lull in progress due to the overall productivity of the company. It is important for team leaders to develop ways to maximize the effectiveness of team reward systems so that they are consistent across different types of situations and are not effected by the variance in developmental stages. Just as individuals develop from infancy into different stages of life, teams also develop in this same way. They begin in infancy and will evolve into interdependent teams who work together for a common goal. Team leaders should be sensitive to these stages of development as well as issues concerning motivation and outside factors that effect the teams overall productivity. Exactly when a team reward system should be implemented will be discussed later. As team reward systems grow and increase in popularity, many organizations will move to teams because of their success in other organizations and their popularity. However, other organizations using individual reward systems may feel that they are successful for them and see no reason to change, even if they decide to move to a team-based management approach. Individual rewards are typically rewards are on pay-for-performance basis. According to Frederick Hills (1979), there are several implications when rewarding on a pay-for-performance basis. First, the criteria for which pay is based are clear and known by the employees. The employee understands that performance determines pay, and he or she sees no secrets or complications because of someone elses performance. Because the employee controls his or her own behavior, he or she has the ability to work well and achieve high performance levels and thus receive increases in pay. The employee is not intrinsically motivated in a pay-for-performance environment - he or she is motivated strictly by salary. Is it possible to use both individual, pay-for-performance reward systems as well as team reward systems? Barry Gerhart of Cornells Center for Advanced Human Resource Studies says "no" (Thornburg, 1992). He believes that the variance in individual performance is too substantial to be successful in a team reward system. He believes that individuals should be recognized for the specific work they do. Others disagree and believe that there are definite ways to incorporate a pay-for-performance structure into a team reward system. One such person is Sue Mohrmon of the University of Southern Californias Center for Organizational Effectiveness (Thornburg, 1992). She believes that it is still too early to know if we should move completely away from individual merit pay. Mohrmon states that a way to define and reward individual team members is needed that will let them give suggestions about their peers and to have a voice in their peers performance reviews. Another proponent of incorporating both individual rewards and team rewards is Steve Kerr of the University of Michigans Graduate School of Business (Thornburg, 1992). He believes that it is definitely possible to keep some sort of merit pay system while also using team reward systems. In an example cited above, it may be possible and very effective to continue to reward individuals annually based on their yearly performance as well as reward the team with more short-term and immediate rewards. Furthermore, it is generally agreed upon that when using a team reward system, it is important to reward individuals who go "above and beyond". A system should be set up by which these individuals will be rewarded for outstanding effort. However, according to Hitchcock and Willard (1995), these individual rewards should never receive more attention than the team rewards. These rewards should also be a surprise. The organization should never make public its intentions of rewarding outstanding performers, and these individual rewards should be presented to the individual in the form of a choice among a few things that this individual particularly enjoys. Another issue to consider in discussion of any type of rewards are the values of intrinsic rewards versus extrinsic rewards. Generally, extrinsic rewards are associated with pay-for-performance, and they may present several problems according to Deci (1976). First, it is difficult to measure the performance of the individual objectively and fairly in order to determine how much of a reward is appropriate. Also, workers will generally to try to find a way to "beat the system" in which they will devise a way to work less and still receive a larger reward. Also, Deci believes that extrinsic rewards such as money and promotions may actually decrease intrinsic motivation. Decis research is controversial and has not been consistently replicated in other research. His findings are interesting to note; however, it should be said that individuals must continue to be paid and extrinsically rewarded by things such as salary even if their work is intrinsically rewarding. If rewards are intrinsically motivating, the individuals supervisor is not required to be around watching over the worker. If the worker is intrinsically motivated, it will not matter that the boss is away. Even if the worker might be able to "get away with" more, such as "slacking off" more, he will not because his motivation comes from within. He will continue to do his best because his reward is more than money. It is important to plan carefully in order to incorporate intrinsic and extrinsic motivation. Extrinsic rewards are important because employees typically will not even consider working for an organization if there are not some attractive salary and fringe benefits. However, intrinsic rewards are the most effective because they will cause an employee to increase upon their self-confidence and competency. Also, it is very important to consider individual differences that may be involved in determining the effectiveness of extrinsic versus intrinsic rewards. Some people, because of individual differences, may value extrinsic rewards while others personality differences may make them more likely to value intrinsic rewards. The importance an individual places on rewards has everything to do with personality differences, backgrounds, and cultural differences which are all out of the control of the organization (Lawler, 1981). In using team reward systems, another important variable to consider is how the effectiveness of these rewards can be measured. It is very important to be able to measure the productivity and performance of the group. Team members should know what these measures are and how they are used. If they are unsure how their effectiveness and contribution is measured, they will typically feel frustration. Therefore, it is very important that these clear, concise measures are in place (DeMatteo, Eby, & Sundstrom, 1998). As mentioned earlier, one of the biggest controversies in the area of implementing team reward systems is when to implement them. The two basic approaches are to implement them immediately at the same time you are implementing team-based management and to implement them later after the organization and team members have adjusted to the team-based management approach. If team reward systems are begun too early in the implementation of team-based management, it is possible that the team members will be distracted and confused by all the changes. As a result, productivity and customer service may suffer (Hitchcock & Willard, 1995). Also, if team reward systems are implemented too quickly, it is possible that the team members will not discover the intrinsic rewards that team reward systems so heavily depend upon. In addition, if reward systems are changed immediately to team rewards that may be more frequent than the individual rewards the employees were used to, it might be interpreted as bribery. Hitchcock and Willard (1995) believe that if the team leaders or management wait to implement team reward systems, it will be easier for the team members to understand the analogy of "sharing the harvest" which was discussed above. They can more easily understand the concept of intrinsic rewards and be better equipped to appreciate this. Another reason for waiting to implement team reward systems is that new work processes have had time to be decided and begun to be carried out, new strategies for business have been developed, and the general acceptance for the use of teams has been gained (Cleland, 1996). Cleland (1996) believes that there are several obstacles that are likely to happen if team reward systems are implemented too early. First, employee and supervisory resistance to change must be overcome. Also, new performance standards must be set and reasonable standards and methods for measurement of performance must be discovered. Finally, how to handle individual contributions must be decided. These things may not necessarily be obstacles but can be considered obstacles in certain situations in which they have the potential to distract from the purpose of the team and to foster concentration on individuals rather than the team. A questionnaire was devised in order to gain a large amount of information about the organization and its current structure. The questionnaire would be given by the consultant or person who was aiding the organization in the implementation of teams to the member of top management or leadership who was virtually in charge of the switch to team reward systems. The first question addresses current types of reward system in order to gain full knowledge of how the organization is currently operating. Next, the manager is asked to explain in detail the types of systems that have worked for the organization. This question was asked in order to see what kind of attitude and opinion the manager has of the systems they have used in the past. It is definitely possible that some of these same types or rewards will be able to be used in the team reward system approach, so it is important that the consultant understand the attitude of the management towards these systems. Next, the manager is asked a series of three questions asking him or her to explain in detail several issues concerning competition in the current reward system environment. In question number three, he or she is asked to describe any situations in which the use of individual rewards causes hurt and/or high levels of competitiveness amongst employees. In the fourth question, the manager is asked to describe any detriments the organization as a whole may have suffered because of competition between individuals. This question was asked in order to gain an understanding of how individual employees may be "stealing" business from each other. For example, an employee might have the opportunity to "steal" the business of a customer that he knows has continuously done business with one of his colleagues because he or she has the desire to raise his or her own personal performance in order to receive an increased reward. If the answer does not give the consultant a full idea of whether or not this situation may be occurring, the consultant will have the opportunity to ask the manager specifically if this is occurring to his or her knowledge. Question number five addresses this issue as well in the context of the employee who is having his or her customers "stolen". Question six asks the manager if the organization is currently using a gainsharing or profit-sharing program and if that is a viable option for the organization. If they are all ready using gainsharing or have the potential to do so, it will be a factor to build upon when the consultant is helping to structure the new team reward system. Questions seven through nine are concerning performance appraisal. It is important for the consultant to find out the current system for conducting performance appraisals and the ways in which the manager feels they can be changed for the better. The consultant should know that the performance appraisal methods will be drastically changed; thus, the managers response to these questions will give the consultant a "feel" for how ready the management is to make these changes. Question ten concerns the managers ideas for what kind of rewards are to come as the conversion is made to team reward systems. It is important for the consultant to have an idea of what the leadership has in mind for future rewards and the kind of timeline in which he or she expects to disburse these reward, which is addressed in number eleven. Question twelve is asked in order to find out how the manager feels the teams will react to the new change. Question thirteen is asked in order to gain information regarding where the organization is considering the implementation of team rewards and at what levels of the company the rewards will be given. Question fourteen is asked in order to gain an idea of how the manager feels high-achievers will react to team rewards. It is also asked in order to find out if the manager feels that occasional, random rewards for "star players" are necessary, and what his or her ideas concerning these types or rewards are. Question fifteen will help the consultant gain insight into what kind of timeline the manager feels is appropriate for the change to team reward systems and whether his or her assumptions are correct. Question sixteen is asked in order for the consultant to simply gain a few ideas and possible facts about the competition of the organization. Finally, question seventeen is asked in order to find out the attitude of the management and whether he or she truly believes in team reward systems. This questionnaire should be used to gain information about the organization, but it may also foster many other questions that the consultant and the manager can discuss together. These questions that are a result of the initial questionnaire will hopefully give the consultant a vast realm of information about the organization itself and attitudes of many members of the organization. The actual model (see Figure 1) that accompanies the questionnaire is a very simple guideline that the consultant can use as he or she gains answers to his or her questions. Each organization that answers the questionnaire is going to be very unique and demand a variation of different strategies in order to implement the team reward system. The model is only a rough estimate and guideline of the different steps the organization can take in order to achieve its goal of implementing a team reward system. In conclusion, there are many different aspects and variables to consider when an organization is deciding if team reward systems are the right reward system to use in his or her organization. It is important that the organization be trained in all of these and given an understanding of things to come in his or her organization as the transition occurs. First and most importantly, the leaders, management, and employees of the organization should be using a team-based management system. Then, they should carefully weigh all the possibilities involved in using team reward systems including all of the benefits as well as limitations. Team reward systems have become a very popular trend for todays businesses and organizations. One possible reason for this popularity is because they allow employees and group members to find intrinsic motivation and to grow personally and interpersonally as team rewards are used. They cause employees to understand the personal fulfillment of achieving a goal as a team and how the achievement of that goal can provide great motivation and self-confidence. It is possible for team reward systems to be used simultaneously with other types of rewards including individual rewards. However, careful consideration should be made by company leaders to make sure this is done correctly and effectively. In implementing team reward systems, the organizations management or team leaders may want to rely on the help of individuals, such as consultants, who are skilled in training companies during the implementation of team reward systems. Organizations can use the help of consultants to determine when the best time to implement team reward systems may be for that particular organization. It is important that productivity levels and continued customer satisfaction are maintained. As the implementation of team reward systems begins, organizational leaders should take steps to ensure that these factors are not ignored. If implemented and used correctly, team reward systems have the potential to be an extremely helpful tool for organizations who are using a team-based system of management. There are many variables that must be analyzed and considered as the transition to team reward systems occurs. Team reward systems have great potential to grow and foster cohesiveness and cooperation within a team as well as enable the employees within an organization to find intrinsic motivation and self-fulfillment within the workplace. 1. What kind of reward systems do you currently have in place? Check all that apply. Please explain how these types of systems have worked for your organization in the past. Do you feel that when individual rewards are received, others are hurt in the process? Do you feel that there is a high level of competition your current reward system(s)? Do you think that individuals compete for rewards at the expense of others or each other? Is your organizations productivity suffering because your current reward system is not working? Is the productivity of any one person suffering because of competitiveness from others based on the pursuit of an individual reward? Does your organization currently use a profit-sharing or gainsharing plan? If not, does the size of your organization allow for this option? 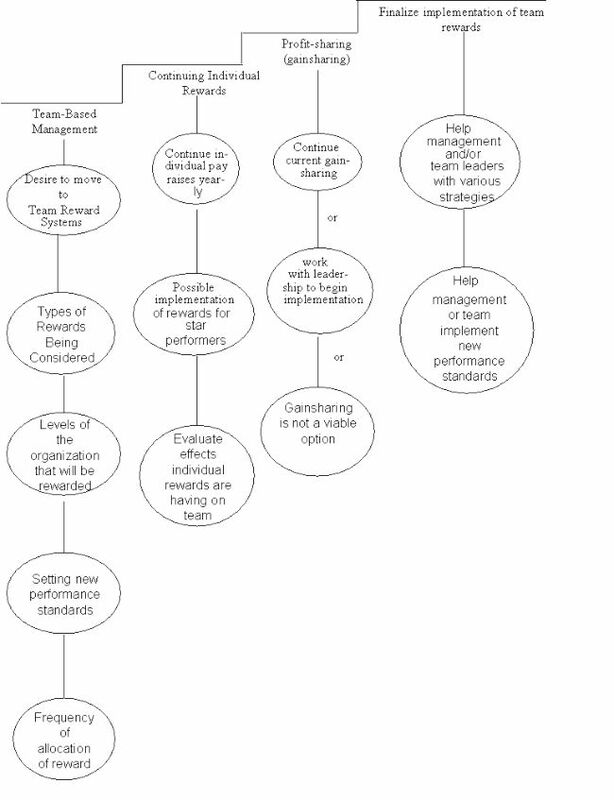 What changes to your current performance appraisal system do you feel would be helpful? What kind of new performance standards do you feel should be set? Do your employees currently receive annual salary increases for performance? If so, at what percentage are these raises? Does this percentage vary among employees? What kind of team rewards do you have in mind for your teams? What suggestions for team rewards do you have? What kind of timeline for disbursing team rewards are you considering? How do you expect your employees to react to the new team reward system? Do you feel that you currently have several "top performers" or "star players" in your organization? How do you feel they will react to the new reward system? What do you think is a reasonable timeline for the implementation of the new system? Do you know what types of reward system(s) your competitors are using? Do you feel like this team reward system is necessary in your organization? Why or why not? Cleland, D.I. (1996). Strategic Management of Teams, pp. 261-261. New York, NY: John Wiley & Sons, Inc.
Deci, E.L. (1976). Intrinsic vs. extrinsic rewards. In K. Davis & J.W. Newstrom (Eds.) Organizational Behavior: Readings and Exercises. Sixth Edition, (pp. 221-222). New York, NY: McGraw-Hill Book Company. DeMatteo, J.S., Eby, L.T. & Sundstrom, E. (1998). Team-based rewards: Current empirical evidence and directions for future research. In B.M. Staw & L.L. Cummings (Eds. ), Research in Organizational Behavior: An Annual Series of Analytical Essays and Critical Reviews: Vol. 20, (pp. 141-183). Greenwich, CT: JAI Press Inc.
Hills, F.S. (1979). Solving the pay-for-performance dilemma. In K. Davis & J.W. Newstrom (Eds.) Organizational Behavior: Readings and Exercises. Sixth Edition, (pp. 216-218). New York, NY: McGraw-Hill Book Company. Hitchcock, D. and Willard, M. (1995). Why Teams Can Fail and What to Do About It: Essential Tools for Anyone Implementing Self-Directed Work Teams, pp. 55-56 & 138-141. Chicago, IL: Irwin Professional Publishing. Lawler, E.E. (1981). Pay and Organization Development, pp. 11-27. Reading, MA: Addison-Wesley Publishing Co.
Nickel, J.E. & ONeal, S. (1990). Small group incentives: Gainsharing in the microscosm. Compensation and Benefits Review, 22, 22-29. Parker, G.M. (1994). Cross-functional collaboration. Training and Development, 48, 49-53. Schuster, J. & Zingheim, P. (1992) The New Pay: Linking Employee and Organizational Performance, 210-219. New York, NY: Lexington Books. Thornburg, L. (1992). How do you cut the cake? HR Magazine, 37, 66-72. Wagner, J.A., Pubin, P.A., & Callahan, T.J. (1988). Incentive payment and nonmanagerial productivity: An interrupted time series analysis of magnitude and trend. Organizational Behavior and Human Decision Processes, 42, 47-74. Center for the Study of Work Teams, University of North Texas.